Franconia Ridge is located in the White Mountains of New Hampshire. As the second highest ridgeline behind the presidential range, it offers absolutely incredible views, and can be completed within a day, or done as an overnight trek. The ridge is comprised North to South of Mount Lafayette (5,249 feet), Mount Truman (not an official 4,000 footer), Mount Lincoln (5,089 feet), Little Haystack Mountain (not an official 4,000 footer), Mount Liberty (4,459 feet) and Mount Flume (4,328 feet). What is a 4,000 footer? This is the most common loop for a day hike. It features views along the ridge, and peakbaggers can take two 4,000 footers in only a few short miles. There are camping options near both ends of the loop, making it a great overnight option for those that would like to experience a sunrise or sunset on top of the ridge. Beginning on the Old Bridle Path, you will ascend to Greenleaf Hut (4,200 feet) in 2.7 miles. As you near the Hut, the trees clear, providing clear views of Lafayette. From the Hut, you will ascend another 1,000 feet in 1.1 miles to the summit. This trail features over 3,700 feet of elevation gain. Beginning on the Old Bridle Path and heading up to Greenleaf Hut and Mount Lafayette (the highest point along the ridge) is, in my opinion, the better route. You will walk southward along Franconia Ridge, which will be the highlight of the hike. The views into the Pemi Wilderness and into Franconia Notch are breathtaking. The ridge exposes you to the elements, but the views are worth it. There are a couple ways to complete this route. The map below shows all of your trail options. If you have an questions, just send a message. The trailhead is located directly off I-93 across from Lafayette Campground. It is clearly marked, and you will be able to navigate directly to it with the map below. Parking at the trailhead can get crazy. This is one of the most hiked mountain in NH. If you want to get parking, avoid the crowds, and not have to park along I-93, you will need to arrive as early in the morning as possible. These tent sites a great options for overnight hikers. Only a half mile from the summit of Liberty located on the Liberty Spring Trail, it is a great place to camp for sunrise, sunset or both. It is inexpensive to spend the night, and rarely do the sites fill up, but when they do, they have additional sites closer to the summit. Fees are paid on site, as reservations for under 6 individuals are not taken. The fee is $8 per person, or free if there is no caretaker. This campground has nearly 100 sites for pop-ups or tents. A cost of $25 per night. You can read about all the amenities, camping seasons and more here. Franconia Ridge shouldn’t be taken lightly. The exposed rock summit and ridge line above 4,000 feet can be a recipe for some strong weather. Be sure to bring enough hydration and energy for a long day. During the summer months, the summits can still be very cold. It is important to always bring layers of clothing to be ready for all situations. Winter hiking involves extra preparation, with far more layers of clothes, and footwear to handle ice and snow (crampons/microspikes). You should read our complete winter hiking guide, and winter hiking equipment guide. The trail begins relatively flat for the quarter mile where hikers make the choice to climb the largest mountain first, or view the gorgeous waterfalls (lets take on the bigger mountain first). Ascending the Old Bridal Path for just under 3 miles, hikers will experience steep and rugged terrain that ascends to the AMC Greenleaf Hut. This steep terrain goes by quick, taking care of heavy elevation gain in a relatively short amount of mileage. The views become rewarding around 2.5 miles into the hike along the Old Bridal Path where a spur ridge of Lafayette creates beautiful views into the valley below, and to the ridge-line you are heading towards. The AMC hut provides, food, water, and a camping options for backpackers. Hikers will pass right on by the hut and descend to a small mountain pond, where you begin the last heavy 1 mile, 1,500 foot ascent to the Mount Lafayette Summit. Quickly above treeline, hikers are exposed to incredible views of Franconia Notch, but also the weather, which in winter months, or storms, can be brutal. The climb is over a well traveled rocky path to the summit. 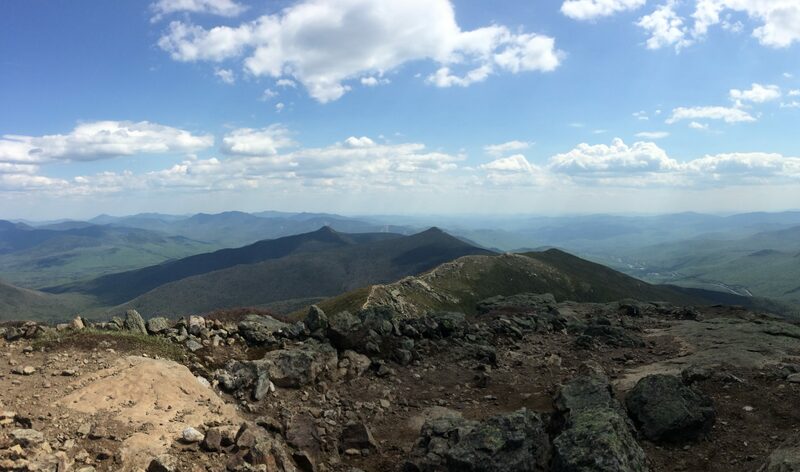 The summit features incredible views year round of the Pemi Wilderness, Mount Washington, Franconia Ridge, and a vast portion of the White Mountains. Here you will begin your exposed ridge walk for 1.6 miles ascending and descending Mount Lincoln, and heading over to Little Haystack Mountain. You will not want to leave this ridge, it is stunning from all angles. Finally reaching Little Haystack Mountain, hikers can choose to further on the hike, or head back down via the Falling Waters Trail (rightfully named so). This trail is technical, steep, and dangerous on the legs and knees, but an absolute blast. Descending quickly, hikers begin to parallel streams that create gorgeous waterfalls, and eventually encounter the largest of the waterfalls near the base, which attracts large amounts of visitors on warm days. From here, it is only a short trip back out to the parking lot, where you can quickly access the highway on to your next trek.